A guide for those who want to learn and write. The New Year has just started and it is now a great time to start working on things that will make you a better you. Exercise is one of those things that, at first, will make you feel crappy. But once your body gets used to it, it will make you feel tremendously awesome and you will want to do it every day. However, you may be someone who hasn’t worked out in a while. So, here’s a quick, simple workout that I do every morning. What I do is a quick full body circuit. I’ll do a combination of exercises like rows, kettlebell swings, squats, overhead presses, push-ups, and Russian twists. I’ll do about 10-20 reps for each exercise and the entire workout will be 15-20 minutes, depending on how I'm feeling that day. But if this type of exercise isn’t your thing, you can also just go for walks or play sports. Just make sure that once your workout is over, your heart rate is up, you have, at the very least, a light sweat going on, and you had fun. Obviously, eating more fruits and vegetables will benefit your health. But so does just cutting out one unhealthy thing from your diet. So if you’ve been eating unhealthy for a while, and don’t know how to change your diet, you can start by substituting one of your unhealthy foods for a healthy one. What I recently did was substitute rice for vegetables. I noticed that I was eating too much white rice and was feeling sluggish and crappy every morning when I woke up. So I decided to do an experiment and cut it out for a week to see how I felt. After the week was over, I felt great so I continued to it. It has been about 4 months now of me not eating rice and I feel amazing! So if you want to eat healthier but don’t know how, you can just cut out one unhealthy thing to start. It can even be switching pop/soda with water. So many people have bad posture from sitting all day, and this can cause a lot of physical pain. So to fix this, you should start stretching on the regular. You don’t have to do anything complex, but just make sure you do it often. Just a few simple full-body stretches throughout the day and you’ll be good. Journaling is a great way to clear your mind before you start your day. What you can do is write morning pages. Before you start doing work, just write down everything on your mind on a sheet of paper. Don’t worry about grammar or clear sentences. This isn’t meant to be read. Rather, it is meant for placing all your thoughts and problems on a piece of paper so that it is no longer in your mind; it’s meant to clear your mind so that you can focus on your most important tasks of the day. If you want to learn how to write morning pages, check out The Artist’s Way by Julia Cameron (affiliate link). Every successful person in the world reads. So to be successful, you have to read. But reading isn’t just meant to make you more money. Reading can also help with your mental health as it reduces stress and calms your mind. What I like to do is read non-fiction before I start my work day and fiction before I go to bed. I’ll read biographies, self-help books or business books in the morning and graphic novels or general fiction at night. Currently, I am reading Sapiens by Yuval Noah Harari as my non-fiction, and On the Road by Jack Kerouac and The Walking Dead by Robert Kirkman and Charlie Adlard as my fiction. If you want to read more but don’t know what to read, check out this blog post on the 5 books that changed my life. Similar to the previous tip, we are animals and we need to get outside and soak up the sunlight. Not only will this prevent depression and let you reconnect with Mother Nature, but it will also allow you to get your body moving. To get more nature, you can go for a walk or hike or jog, or go do some yard work. Start gardening or playing an outdoor sport. There are numerous things you can do outside, so just pick an activity and do it. What I really enjoy doing is mowing my lawn. It’s a great way for me to get outside and it’s also a great workout since I use a non-motorized mower. But I live in Canada so I can only do this in the summer. In the winter, however, I try to go for walks when it is warm. What activity are you going to choose? Too much of anything is a bad thing and this absolutely applies to the amount of time you spend staring at a screen. Not only does it negatively affect your sleep-wake cycles and eyesight, but too much social media also affects your mental health. So it is very important to take breaks from it. What I like to do to prevent myself from going onto social media on my phone is to hide the apps. Instead of putting it on the home screen, I just leave on it in the apps catalog. And if you’re an iPhone user, you can prevent yourself from going onto it by putting your social media apps in a folder, and then place that folder on a page far from the main one. This will help prevent you from going onto apps like Instagram or Twitter, for example, because it won’t be the first thing you see when you turn on your phone. Additionally, it will be kind of a chore to look for the apps. Doing creative activities is fun and can relieve stress. What I like to do as a creative outlet is write blog posts and think of funny stories. I find that it’s very therapeutic for me to write and really fun for me to just think of the funny in everything that I see and/or do. But these aren’t the only activities that you can do. You can draw illustrations, colour pictures, create videos, take photographs, make pottery, bake, cook, write calligraphy… you can do pretty anything your heart desires. You just have to remember to have fun with it. Now, it’s very easy to just view issues from one side of the spectrum. But it’s important to know both sides because it will give you a better understanding of the issue. You don’t have to agree with the other side, but you should try to understand it and where it is coming from. And this doesn’t just apply to politics and social issues. You should be viewing things from both sides with pretty much everything that you do. If you get into an argument with your significant other, try to see where they are coming from. If you get into a disagreement with a friend or family member, try to see where they are coming from. This will help you understand the people around you better and can promote a better relationship. I feel like we, as human beings, are too negative. When something bad happens to us, we only view the negative aspects of it. But there is a positive side to everything that happens to us. Whether it be a lesson that we get to learn or an opportunity that was never considered, something good can come out of it. So try to find the positive in every bad situation. 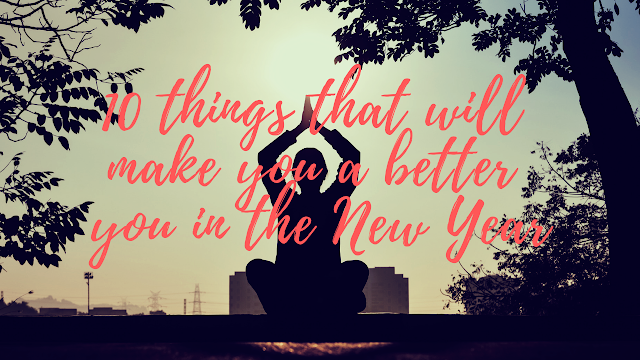 That’s the 10 things that you should do to make you a better you this year. Which activity are you going to start with first? Or which one seems like it will be most beneficial to you? Share them down below in the comments. Is there something that you want to learn this year? Do you want to learn a new skill, like coding, or a new subject, like psychology? If so, I have a guide for self-directed studies that you can use to design your program. Mine is meant for individuals who want to learn about the world, but you can just swap out the items for things that apply to what you want to learn. Click here to check it out. 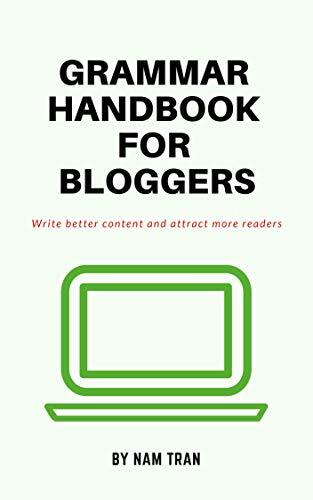 If you find the content of this blog interesting and helpful, you can support it by buying my grammar guide for bloggers. Click the image for more info on the book. Some of the product links and ads on this blog are affiliate links. What this means is that if you buy something via the link or ad provided, I will get a small commission, at no extra cost to you.